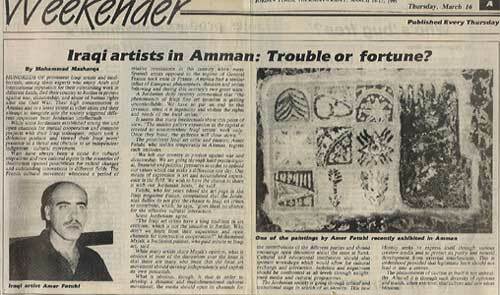 Iraqi Artists in Amman: Trouble or Fortune? Hundreds of prominent Iraqi artists and intellectuals, among them experts who enjoy Arab and international reputation for their outstanding works in different fields, fled their country to Jordan in protest against war, dictatorship, and abuse of human rights after the Gulf War. Their high concentration in Amman and to a lesser extent in other cities and their attempt to integrate into the society triggered different responses from Jordanian intellectuals. While some Jordanians established strong ties and open channels for mutual cooperation and common projects with their Iraqi colleagues, other took a defensive position and viewed their Iraqi peer's presence as a threat and obstacle to an independent indigenous cultural movement. A Jordanian daily recently commented that "the phenomenon of Iraqi fine art invasion is getting uncontrollable. We have to put an end to this invasion, since it is ingenuine and violate the rights and needs of the local artists". It seems that many intellectuals share this point of view. "The sudden gallery expansion in the capital is created to accommodate Iraqi artists' works only. Once they leave the galleries will close down". The prominent Iraqi art critic and painter, Amer Fatuhi, who resides temporarily in Amman, regrets such attitudes. "We left our country in protest against war and dictatorship. We are going through hard psychological, financial and political pressures in order to uphold our values which can make a difference one day. Our means of expression is art and accumulated experience in the field. We wish to have the chance to share it with our Jordanian hosts", he said. Fatuhi, who for years edited the art page in the Iraqi magazine Funoon (Arts), complained that the Jordanian dailies do not give the chance to Iraqi art critics to contribute, which, he says, "gives them no chance for the effective cultural interaction". "The Iraqi art critics have a long tradition in art criticism, which is not the situation in Jordan. Why don't we learn from their experience and open channels for constructive cooperation? 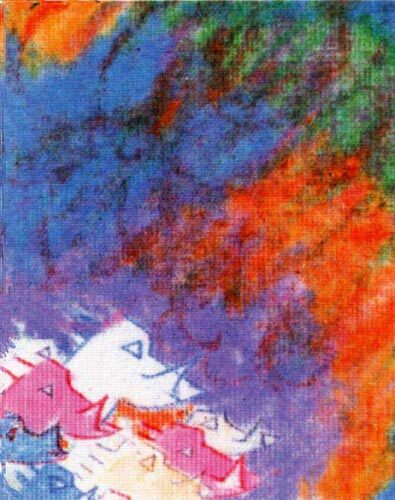 ", Mohammed Majali, a Jordanian painter, who paid tribute to Iraqi art, said. While many artists share Majali's opinion, what is obvious at most of the discussions over the issue is that there are many who insist that the local art movement should develop independently and exploit its own potentials. What is obvious, though, is that in order to develop a dynamic and multidimensional cultural movement, the media should open its channels for the contributions of the different parties and should encourage open discussion about the issue at hand. Cultural and educational institutions should also sponsor workshops which would allow for cultural exchange and interaction. Isolation and negativism should be confronted at all levels through enlightened media and cultural programs. The Jordanian society is going through critical and transitional stage in search of and identity. This new identity seeks to express itself through various creative media and to protect its purity and natural development from external interferences. This is understood provided that legitimate fears should not lead it into a corner. The phenomenon of caution in itself is not unhealthy. After all it is through such diversity of opinions and stands, often extreme, that culture and new ideas blossom.